The most controversial part of the match was actually not the top Zilean and jungle Jayce combo. 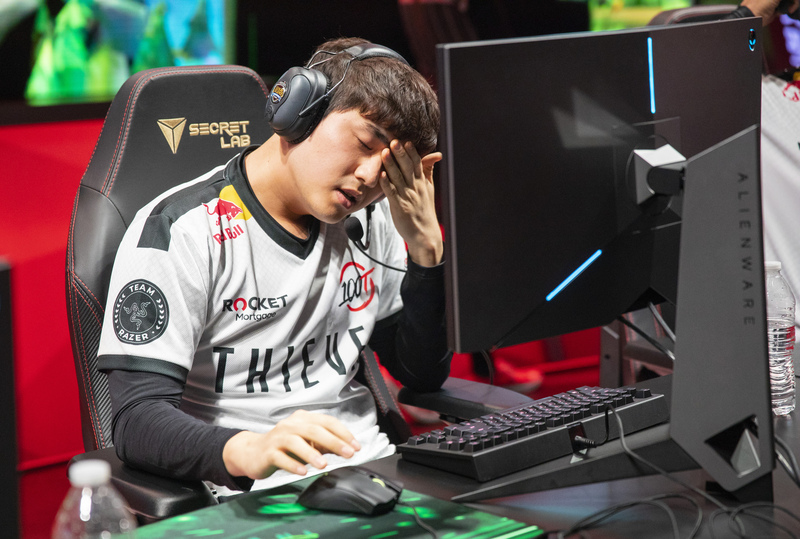 At first glance, the craziest thing about the 100 Thieves vs. Clutch Gaming LCS match on Saturday was the champion picks. Clutch showed their galaxy brains in the draft by combining a jungle Jayce with a top lane Zilean. A quick explanation on what happened: This mechanic was originally discovered years ago. Because of unit collision, minions can run into champions, turrets, terrain, etc. Anyone who’s been blocked from moving by minions understands what that feels like. But if you do it on purpose, like the way 100 Thieves walked in front of the minions at level one, you can influence the way waves interact. In this case, slowing down the incoming minions allows the opposing wave to attack first while concentrating damage on the lead minion. This eventually sets up a freeze where the enemy laners have to extend past the river to CS. Years ago, Riot instituted a fix where the minions are ghosted—which means they ignore unit collision—until they reach a certain point in the lane. That point seems to be about halfway, just past the inner turret. But after they reach that point, they can collide with things like champions again. The problem is, a couple weeks ago, streamer Adrian Riven figured out where the ghosting ended, either because that was the design of Riot’s fix or because something subsequently broke it. His video made it around Reddit, but for competitive play, multiple coaches were given explicit instructions from Riot that the mechanic was illegal and would result in a forfeit. But not every coach got that memo: 100 Thieves coach Neil “pr0lly” Hammad certainly did not. To be clear, we’re not faulting pr0lly or his team. He asked Riot about this in detail and was given the green light—and he’s not alone. At the end of the day, his team got the win, so Riot endorsed the action. The fact that the move isn’t allowed was the same message that Clutch Gaming coach Brendan McGee received from Riot. According to Misfits coach Hussain Moosvi, multiple teams are now taking the issue up with Riot again to clarify the rules. But the real issue is that things shouldn’t have gone this far. It’s okay to disagree on which champions are strong and what’s best in a meta. But if rule issues are brought up and answered, Riot should make its responses clear and available to every team. Update Feb. 10 10am CT: LCS Commissioner Chris Greeley responded to the issue on social media by confirming that blocking minions is not an offense, but that pinning one against a turret or terrain is. He admitted that the explanation videos Riot previously released to teams included both blocking and pinning, which confused teams. He also noted that when teams asked about the mechanic, some were issued flat responses that it was not allowed, while others who were more specific in their inquiries were told that blocking is allowable. Greeley then apologized to Clutch Gaming specifically for the miscommunication.